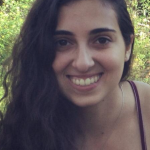 My name is Shira Krupat, I am 20 years old and I live in Ra'anana, Israel. My family and I joined Hod ve Hadar 6 years ago, when we made Aliyah from Toronto, Canada. That year, Susie told me about her bar/bat mitzvah teaching course, as I had been reading Torah and haftarah on a regular basis. I enjoy reading Torah very much and feel it is a perfect way to combine my love for singing and music and my connection to Judaism. I joined the program with Susie, along with several other high school students from the kehila. Susie taught us how to teach, very professionally and with love, and as a result, throughout my high school years I taught many bar/ bat mitzvah students- something I may not have been a part of had Susie not run that course. I feel that experience created many opportunities and opened many doors in my future, and also brought me closer to the kehila and motivated me to be more active in the Jewish community. I am now serving in the army and still reading Torah regularly at Hod ve Hadar. I enjoyed recording with Susie very much. This project is very important and I am proud to be part of it.